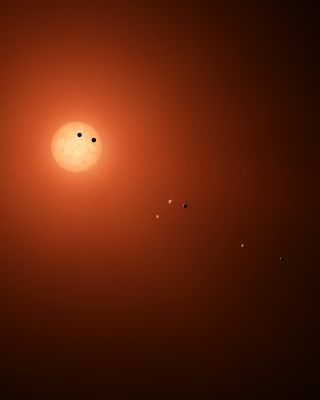 Artist's illustration of the seven Earth-size planets in the TRAPPIST-1 system, which is located 39 light-years from the sun. The three potentially habitable planets in the TRAPPIST-1 system may be even more promising abodes for life than scientists had thought. These three tightly packed alien worlds trade material much more liberally than do planets in Earth's solar system, meaning they may have seeded each other with the building blocks of life, or perhaps even life itself, a new study suggests. The ultracool dwarf star TRAPPIST-1, which is just 8 percent as massive as the sun, lies 39 light-years from Earth. In May 2016, researchers led by Michaël Gillon of the University of Liège in Belgium announced the discovery of three Earth-size planets orbiting TRAPPIST-1. (The team used the TRAnsiting Planets and PlanetesImals Small Telescope in Chile, which explains the star's common name.) Further observations revealed that the system hosts seven rocky planets, a stunning find that was announced in February of this year. In addition, Gillon and his colleagues determined that three of these seven planets appear to lie in TRAPPIST-1's "habitable zone," the just-right range of distances that could support liquid water, and possibly life as we know it, on a world's surface. Because TRAPPIST-1 is so dim, its habitable zone lies very close to the star. Indeed, the three residents of the zone zip around TRAPPIST-1 every 6.1, 9.2 and 12.4 Earth days, respectively. For comparison, Mars and Earth never get closer to each other than about 33.9 million miles (54.6 million km), and they're usually much farther apart than that. The habitable zone, illustrated for Earth's solar system and the TRAPPIST-1 system. Planets too close to their star are likely too hot for life (red), and those too distant are probably too cold (blue). But in between, conditions may be just right for liquid water and, perhaps, life as we know it. Panspermia in the TRAPPIST-1 system? Despite the considerable gulf between them, Mars and Earth trade material — rocks and dirt that have been blasted into space by powerful impacts. Scientists have even studied some of these Red Planet samples. The most famous example is probably the Mars meteorite ALH84001, which some researchers claim contains fossilized microbes. Some scientists even think that life may have first arisen on the Red Planet, then landed on Earth aboard a voyaging rock like ALH84001 — an idea known as interplanetary panspermia. In the new study, Lingam (who's based at Harvard University) and Loeb (who chairs Harvard's astronomy department and also works at the Harvard-Smithsonian Center for Astrophysics) investigated the probability that interplanetary panspermia may have occurred in the TRAPPIST-1 system. The duo devised a relatively simple model that takes into account planets' masses and distances from each other, the mass of their host stars and several other factors. The researchers plugged the relevant values for the TRAPPIST-1 system into the model, using planets e and f as the rock swappers, and compared the results with those for Earth and Mars. "We found that, compared to Earth-to-Mars [panspermia], the likelihood is about 10,000 times higher" for the TRAPPIST-1 planets, Lingam told Space.com. This difference between the two systems stems primarily from two factors, the researchers said. First, a larger proportion of blasted-off TRAPPIST-1e rocks make their way to planet f, compared to Earth-to-Mars material. Second, TRAPPIST-1 rocks reach their new home world much more quickly — perhaps 50,000 years or less on average, compared to about 5 million years for Earth-to-Mars material — and are therefore exposed to lower levels of damaging radiation. The results don't imply that panspermia has actually occurred in the TRAPPIST-1 system, of course. That would require the prior existence of life, and scientists don't know if a TRAPPIST-1 world has ever been inhabited. But the new study does suggest that the odds of organisms evolving on a habitable TRAPPIST-1 planet are pretty good, at least compared to worlds in Earth's solar system, the researchers said. The increased rock-swapping would probably lead to a robust trade in complex organic molecules, helping create conditions amenable to the origin of life on multiple TRAPPIST-1 worlds, Lingam and Loeb wrote. The new study further indicated that if panspermia is indeed operating at TRAPPIST-1, the system is likely to have more life-bearing planets than Earth's solar system does. If that's the case, scientists will want to figure out if the life-forms on those alien worlds are all related to each other, or if they arose independently. And Lingam and Loeb provided a few possible ways to make that determination. Such considerations may apply to more than just TRAPPIST-1 or other dwarf-star systems like it. The distances among the habitable-zone TRAPPIST-1 planets are similar to those that separate Jupiter's four biggest moons (Io, Ganymede, Europa and Callisto), Lingam said. So, panspermia could well occur among the moons of a Jupiter-like exoplanet in the habitable zone of its star, and "it may operate in the same way that we described for the TRAPPIST-1 system," Lingam said.